ANAMAR was contracted by Infrastructure Engineers, Inc. to apply for and obtain permitting for the repair of a nearly 20-year-old dock complex at the U.S. Coast Guard (USCG) Sector Long Island Sound. The dock complex is south of the Quinnipiac River mouth, along the east shore of New Haven Harbor in Long Island Sound, New Haven County, Connecticut. The waterfront structures of the dock cover approximately 6,500 square feet over water. It consists of an eastern floating dock and a western floating dock. The eastern floating dock consists of a removable aluminum gangway leading to floating docks 1 through 5 (numbered from southwest to northeast). The western floating dock consists of a concrete pier leading to a fixed steel pier and parallel timber pier, with a western floating dock and associated aluminum gangway. The concrete and timber piers have an attached timber wave screen on their west side. A buoy loading platform is at the base of the concrete pier, attached to the concrete bulkhead. The project goals were to obtain state and federal permitting to repair or replace various components of the aging existing waterfront structures to maintain USCG operations involving maritime homeland security, law enforcement, search and rescue, marine environmental protection, and maintaining aids to navigation. ANAMAR generated all application materials necessary for USCG to obtain a Coastal Management Consistency Review determination through the Connecticut Department of Energy and Environmental Protection (CT DEEP) and a General Permit through the U.S. Army Corps of Engineers New England District (USACE) via a joint application process. The application and supporting information were generated by ANAMAR and sent to USCG in May 2018 for submittal to CT DEEP and USACE. 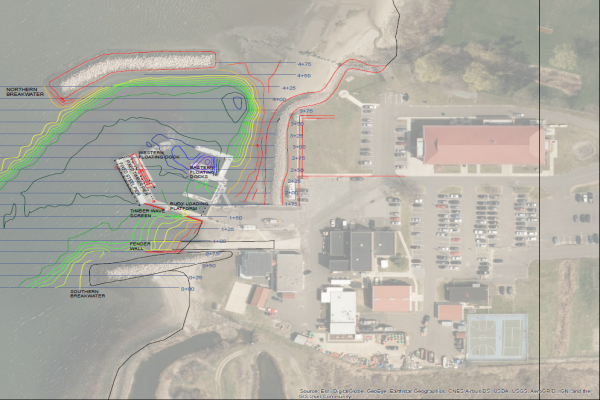 The USACE General Permit was obtained on September 20, 2018, with concurrence from CT DEEP that the project was consistent with Section 307 of the Coastal Zone Management Act.